When I play a much stronger player, my thought process is sometimes affected. On the one hand I feel I have the freedom to play aggressively and more instinctively, because a loss would not be unexpected. On the other hand I don’t want to embarrass myself by losing in 15 moves. One of the impacts of this imbalance in thought reveals itself when I get to the endgame safely. 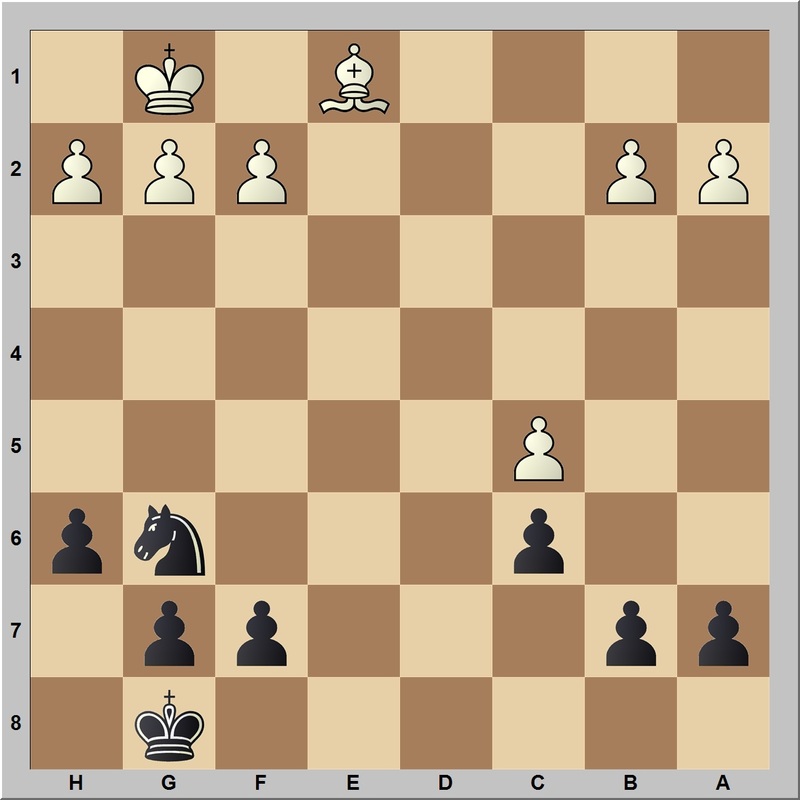 Instead of thinking “He could not beat me in the opening or middlegame. 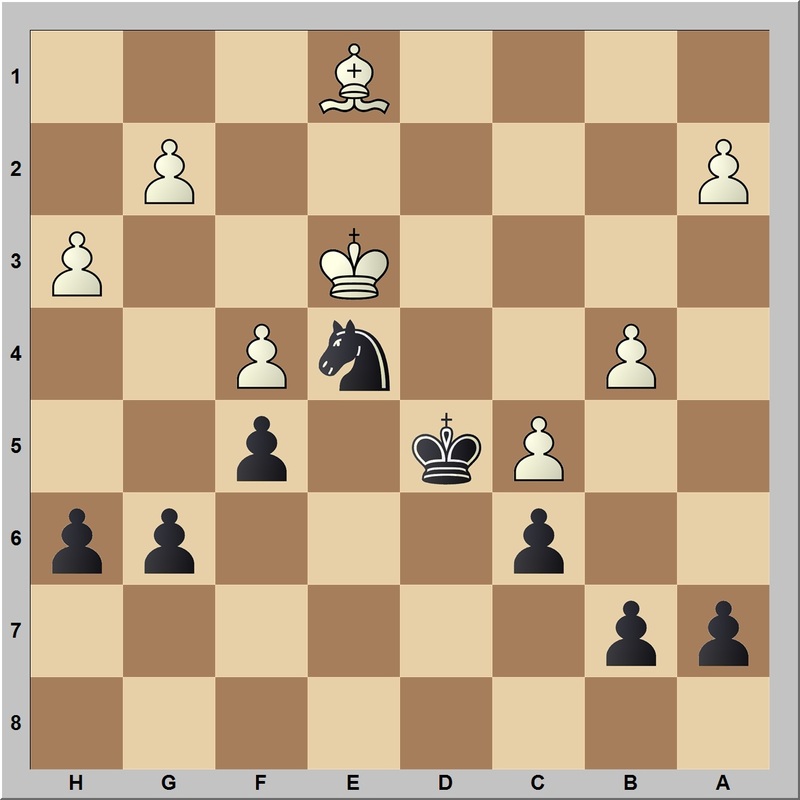 How do I win this now?”, I seem to think “Thank goodness I survived the opening and middlegame. How do I not lose this now?”. That in turn means that, when I get a draw offer, I tend to jump at it. Mission accomplished, I did not lose. What I don’t consider is that the draw offer might be an attempt by the stronger player to not lose. Here is an example from a recent game, where my opponent was rated about 1820 versus my about 1570. After a Queen’s Gambit Declined Exchange variation opening, we exchanged Queens by moved 16, with the rooks off the board by move 25. He initiated the rook exchanges, which made me think he wanted a draw. This was the position after 25.Bxe1. In the Bishop and 6 pawns versus Knight and 6 pawns ending that followed, I managed to get my Knight onto a good outpost and my King to a good central square. His pawns were induced onto dark squares, so my position was looking pretty good after move 33 (below, where Stockfish 8 rates it around -0.3), but I didn’t know if I could convert. In honesty, I was just waiting for the draw offer. White played 34.Kd3 here to stop my King from entering his position, but after some more maneuvering and what he told me afterwards was an attempt to get a win, his King went over to the king-side and his Bishop to the Queen-side, leading to this crucial position. Now put that in front of me as a tactics problem, and I probably get it. 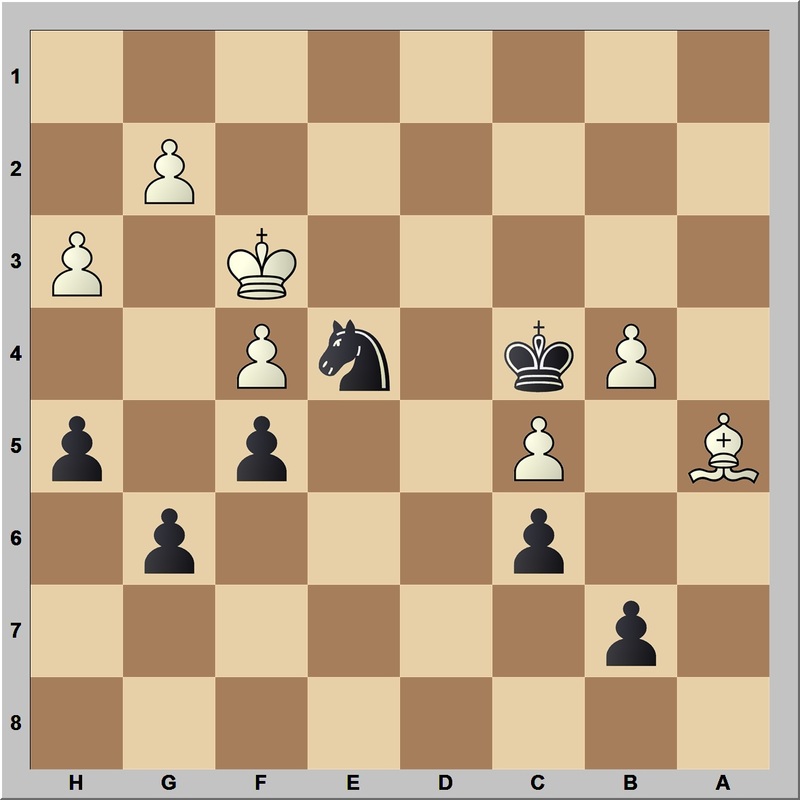 But in the context of a game I am, incorrectly, trying to draw, I missed the winning 43…Kb5 44.g4 Nxc5! taking advantage of the overloaded b-pawn. Instead I brought my King back to d3 and after a few more moves he offered a draw. So the lesson is, when a stronger player offers a draw and you have time left on your clock, take a minute or two to evaluate the position independently from the situation, i.e., your opponent’s rating and your aims with the game to that point. Nice article! I have the same thought process when i play higher rated opponent! Wow, it looks like you played into the same exact endgame that a good friend of mine did. His GM coach said he played a good game, so I’ll leave that comment here for you, too. Just a thought on the psychology: you initially said that you experience a sense of freedom to take risks versus higher rated players; but then said you were lauding yourself for not losing yet. I think that paradoxical thinking can be harmonized to help you play better chess. If you look to play with stability, trying to improve, but not be straightforwardly aggressive, but do allow your mentality to be, “I’m going to pick my shot in a critical position, and spend a large amount of time evaluating my post-move position,” then I think there can only be successes to be had. In this case, the game you played ended up requiring quite a bit of technique to close out. By that, I mean the accuracy of successive moves will require you to minimize error to a certain degree, otherwise it will end in a draw, and possibly (doubtfully) a loss. If, like my friend, you were short of time in the final position, as my friend, a student of Nigel Davies was, then you may very well have to be good at video game speed chess to win this position. If not, then a draw was probably wise. Congratulations on the big draw and, in a sense, victory. You know you belong, now, which is another step in you improvement. Some good thoughts there on how to think. Time wasn’t a real factor; I had about 9 minutes left. Psychology and not evaluating the position at the point of offer, were my downfall. In terms of playing well early on, most of that is down to sticking with a simple opening repertoire, learning the lines and understanding your and your opponent’s plans. This happened to be one of the lines I knew and I managed to rattle off the first 10 or so moves in a minute. Thanks for the comment, appreciate the views. These studies are brilliant. Genuine, honest thoughts and solid points to learn from. Keep posting these. I am very impressed. I am going to add these to my study routine. Look forward to future ones. Thank you Tim. Glad you enjoy them.